The history of epilepsy is a tale full of mysticism and superstition. It was first described in 2000 BCE by the Mesopotamians as antasubbu, or “hand of sin.” The Akkadian text describes a patient having an epileptic seizure that was brought on by the god of the Moon; the patient underwent treatment by means of exorcism. Almost one thousand years later (1067-1046 BCE), a Babylonian named Esagil-kin-apli wrote history’s first medical handbook called Sakikku. This six-chapter text contained detailed symptoms descriptions, physical examination findings, disease etiology, prognosis, and treatment. In the Neurology chapter, he described many features of different seizure types including absence, tonic-clonic, infantile, febrile, gelastic, simple, and complex partial seizures. He hypothesized that each type of seizure was caused by possession from a particular evil spirit; therefore, the treatment was not medicinal but spiritual. Hippocrates rejected the popular notion that epilepsy was a spiritual disease and instead considered it as a disease of the brain that was potentially treatable. Despite critics such as Arteya and Hippocrates, epilepsy was largely considered a spiritual condition until the 18th century. It wasn’t until the last 200 years that major progress was made in understanding the pathophysiology, diagnosis, management, prognosis, and prevention of this condition. As nephrologists, our involvement in the diagnosis and management of epilepsy can be as paranormal as its history. We are aware of the increase of incidence of seizures in CKD (~10%) and uremic encephalopathy (~33%); however, our neurology colleagues are often the shipmaster. Given this epileptic sequela, should nephrologists assume the role of chief mate when it comes to managing seizures in patients with kidney disease? In the first category, we are reminded of how accumulated toxins and some clinical conditions can coalesce into a perfect epileptic storm in uremia. We are reminded that there is no isolated uremic compound that is the cause of seizures, but rather a combination of toxins, hormones, medications, and electrolyte imbalances that provoke them. Additional insults such as acidosis, hypertension, and even subclinical air embolisms during dialysis are additional factors for patients with impaired GFR. While uremic seizures can have variable presentations (myoclonic, absence, generalized tonic-clonic etc. ), the authors stress the importance of maintaining a low clinical threshold to obtain further neurologic testing for non-convulsive seizures in uremic patients with persistent severe encephalopathy. Furthermore, one must be vigilant to distinguish myoclonic seizures from intermittent uremic myoclonus. For the treatment of acute uremic seizures, nephrologists should also consider the underlying cause (other than uremia), and whether there is a high risk for recurrence. Typically, hemodialysis can often reverse the cause but given the increased risk of seizure recurrence in patients with CKD, AED treatment is also warranted. There is no first-line agent, but good options for initial monotherapy are levetiracetam, phenytoin, valproic acid, and lacosamide. Dose reduction of the AED may be required when a drug or metabolite is excreted at least 30% unchanged in urine. Additionally, clearance of the drugs by HD may require post-HD dosing. The volume of distribution of highly protein-bound drugs may be affected by uremia. It is advisable to monitor free serum levels of highly protein-bound AEDs such as phenytoin and valproic acid. Uremic toxins may downregulate cytochrome P450 (CYP450) systems. This affects AED metabolism, but also affects interactions between certain AEDs and other medications. Pharmacokinetics of Major Antiepileptic Drugs. Table 1 from Titoff et al, AJKD, © National Kidney Foundation. Dose Adjustments for AEDs in Kidney Disease. Table 2 from Titoff et al, AJKD, © National Kidney Foundation. In conclusion, kidney disease is associated with a slew of neurologic manifestations. As specialists on the front lines treating both the acutely ill and dialysis patients, we can learn to recognize these presentations and intervene early. This review by Títoff et al provides an epileptic map for practicing nephrologists on how to navigate acute symptomatic seizures and epilepsy in CKD and ESKD. With a deeper understanding of epilepsy and kidney disease, nephrologists can now jump on deck as chief mate to the shipmaster (the neurologist) and help sail towards more tranquil waters. – Post prepared by Natasha N. Dave, AJKDBlog Contributor. Follow her @NatashaNDave. 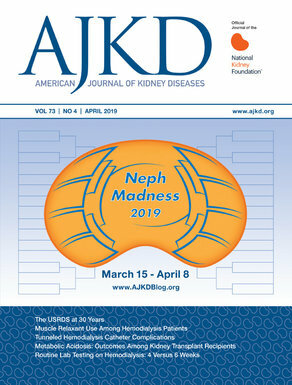 To view Titoff et al (subscription required), please visit AJKD.org.